TUSCALOOSA, Ala. – A new study on the resale value of fortified home construction by The University of Alabama’s Insurance Research Center was the topic of discussion today (Wednesday, Aug. 3) at the White House. The panel discussed property loss mitigation – past, present and future – at the White House Forum on Smart Finance for Disaster Resilience. The Alabama Center for Insurance Information and Research and the Insurance Institute for Business & Home Safety were present for the panel discussion. Ballen said strong, well-enforced building codes are the starting point for successful mitigation, but codes have limitations. She said 13 states do not have statewide codes in place, and many locations with codes do not enforce them effectively. “This led IBHS to develop its voluntary, market-based FORTIFIED Home™ program, which is a set of engineering and building standards designed to help strengthen new and existing homes through system-specific building upgrades to minimum code requirements that reduce damage from specific natural hazards,” Ballen said. 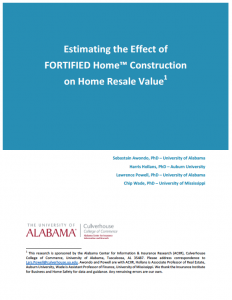 The study, “Estimating the Effect of FORTIFIED™ Home Construction on Home Resale Value,” is about the effect of IBHS FORTIFIED Home™ designations on home values in Mobile and Baldwin counties in Alabama. ACIIR’s study found that switching from a conventional construction standard to a Fortified designation increases the value of a home by nearly 7 percent — holding all other variables constant. The findings suggests that building Fortified houses or retrofitting houses to meet Fortified standards is an economically sound investment. The additional cost of building or retrofitting is frequently is less than 7 percent of home value; therefore, the benefit of a Fortified designation is likely to outweigh costs. This is without considering other direct benefits such as insurance premium discounts, potential uninsured rebuilding costs and the inconvenience of temporary housing following a disaster. ACIIR staff members add that given the robustness of statistical results, they believe it is appropriate for appraisers and financial institutions to reflect Fortified designations in appraisals for use in the mortgage process. In addition to ACIIR staff, the report is coauthored by professors from Auburn University and the University of Mississippi with expertise in finance and real estate. The Alabama Center for Insurance Information and Research provides highly credible information and research insight for the benefit of key stakeholders across Alabama, including policymakers, the public, insurance companies, intermediaries, trade groups and other parties that need information concerning the management risk. The center is dedicated to providing facts to parties who directly contribute to the economic development of Alabama. Learn more at aciir.culverhouse.ua.edu.